Procedure codes represent the services that you render and products that you sell. Your Dentrix Ascend database comes with all the current ADA Procedure Codes, which are updated automatically as needed, but you can add your own custom procedure codes to your organization. Specify the code, description, office code, category, location's fee, and treatment area; and set up the other options as needed. Code - Type the code for the procedure. You can search for procedures by the code wherever you can enter a procedure. You cannot change the code once you save the procedure code. If you type an existing procedure code, type a suffix for the code (for example, if you want to create an alias code for D0330, you can create a procedure with "1" as the suffix) in the additional field that appears. An alias code is a procedure code followed by a period (.) and then a custom alphanumeric value up to five characters in length. Having an alias code (alternate code) allows you to have duplicate procedures in your organization's database, so you can, for example, charge different rates for similar procedures but have the same ADA Procedure Code show on claims. Description - Type a description, either the standard ADA description or a custom description, for the procedure. You can search for procedures by the description wherever you can enter a procedure. Office Code - Type the code, either a shorthand version of the ADA code description or a custom code, for this procedure. Category - Select the ADA Procedure Code category that this procedure belongs to. There is also an option to specify that this procedure is a product (such as a power toothbrush or a home bleaching kit) that will not be billed to insurance. Include in favorites - Favorite procedures are the ones that you use most commonly. Turn this switch On to mark this procedure as a favorite so that you have quick and easy access to the procedure when you are charting procedures. Favorites have a yellow star next to them in the list of procedure codes on the Procedure Codes & Conditions page. Bill to insurance - To flag the procedure as being billable to insurance by default when posting the procedure, turn the switch On. If the procedure should not be billable to insurance by default, turn the switch Off. 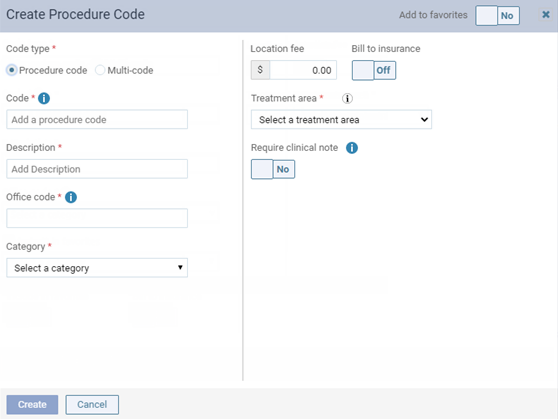 Even though this option is available for an alias procedure code or a non-standard code, some carriers may reject that procedure on a claim or may reject the entire claim due to the presence of an unrecognized procedure code, so turn this option on with care if the procedure code is not standard. Being able to bill a non-standard code, such as a rate code, to an insurance carrier is helpful for Federally Qualified Health Centers (FQHCs) when a rate code is needed for a wrap claim. Location fee - Type the default amount that you charge at this location for this procedure. Treatment Area - Select the treatment area that this procedure corresponds to: Tooth, Mouth, Surface, Quadrant, Root, or Range (range of teeth, such as an arch). This option is not available if the selected Category is Products.